Portraiture is an art form that has fascinated the human race through the ages. This workshop will explore historical, traditional and contemporary portrait making conventions which will facilitate the creation of your own style of making a portrait using mixed media. 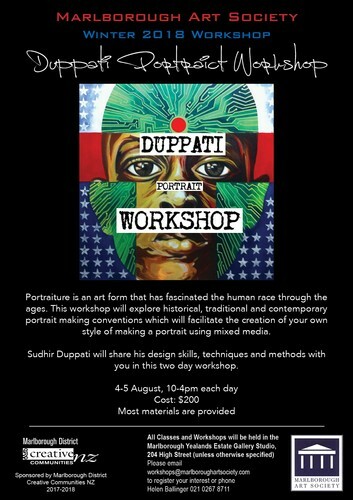 Sudhir Duppati will share his design skills, techniques and methods with you in this two day workshop. Most of the materials will be provided. Call Helen Ballinger 021 0267 8711 or email - workshops@marlboroughartsociety.com to register your interest.